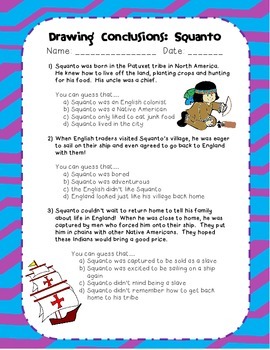 "Drawing Conclusions: Squanto" is a worksheet that teaches inference skills and common vocabulary used for the story of Squanto and the Pilgrims. The multiple choice questions are supplemented with a creative writing assignment at the end of each page. This is part of the Drawing Conclusions 2 Series, which is an ideal tool for teaching inference skills in reading for elementary students. ESOL students will especially benefit from the use of common phrases and vocabulary used in American speech.